These Scotch 5" x 7" Photo Size Thermal Laminating Pouches preserve and protect your items you refer to or handle frequently. 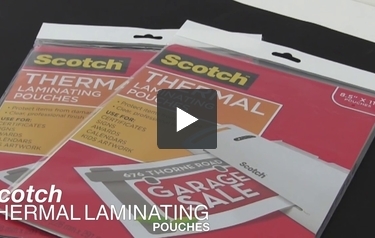 These 5 mil thick thermal laminating pouches are for use with thermal laminators. Pouches are clear to let important information show through with a professional finish. Get 20pk on every order of Scotch 5" x 7" Photo Size Thermal Laminating Pouches. I got this product to try in my home for free. I am very much impressed with the quality and results. This size is perfect for arts and crafts uses. When used in the Scotch laminator, you get a great result and very fast. I have yet to have anything turn out where I would be concerned at the quality. I highly recommend and couldn't be happier with my experience with this product. Super easy, super quality, super happy! I got this product free from 3M to test and review along with the laminator. I surely liked this product because it has the right quality and clarity in it. I used these pouches to laminate my photos, and it came out nicely. The best thing is that these laminating pouches protect the documents without comprising their clarity. Loved them.